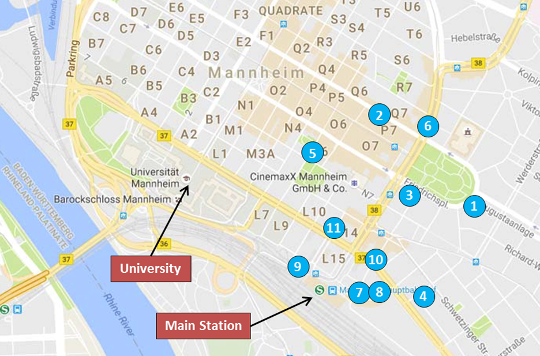 The EFA 2017 has secured rooms in selected hotels close to the Mannheim campus. Booking conditions and information can be found on each hotel's webpage. Please note that only the Radisson Blu Hotel (2), the Maritim Parkhotel (3), and the RAMADA Hotel (11) are available from Tuesday, August 22, 2017. All other hotels have been secured from Wednesday, August 23, onwards. *Distances are calculated with Google Maps.